Standing on the edge of Jebel Shams surrounded by Shepherds walking down tracing my way through a comparatively easy trek down,I wondered how many places will give you that feel of completely rustic way under.Staying in a campsite with the bare mountains or in the middle of sand dunes,I discovered this was the place I was looking for. 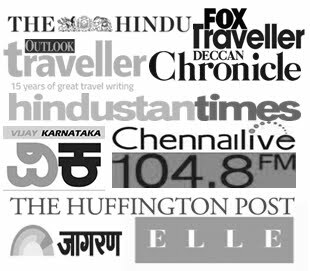 Culturally Rich,yet Unspoilt. Twice the capital of Oman, Nizwa is the birthplace of Islam in Oman. 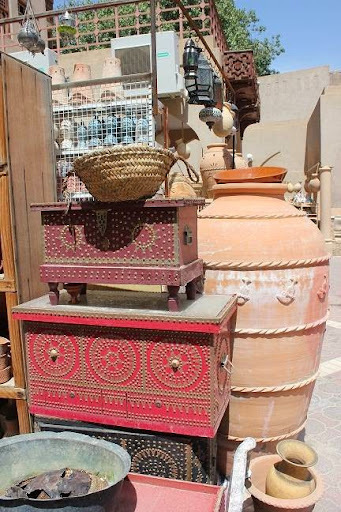 Nizwa is also the cultural capital of Oman with Traditional Forts and Souks. From the adjacent Wilayat of Sumail, Mazin Bin Ghaduba the companion of Prophet Muhammad (Peace be Upon Him) traveled to Mecca to embrace Islam. He was the first Omani to embrace Islam(because he thought Oman is a peaceful country without any problems/war). The men wear it on ceremonial occasions; Khanjars worth 250 Rials,rich and well to do may have Khanjars costing 600+ rials. On Fridays, from early morning like 7-8 am, there is an unmissable sight of big cattle market. 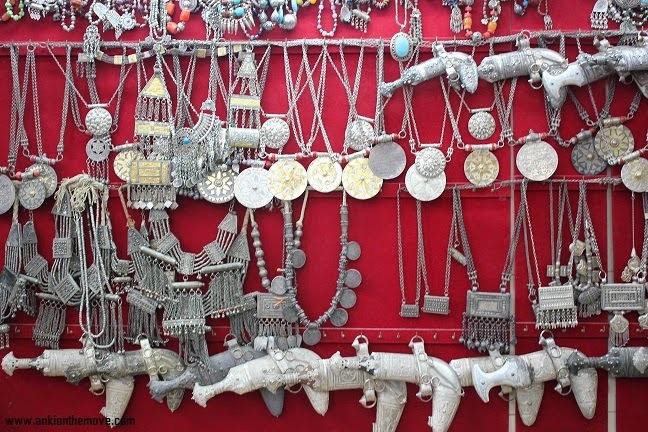 Bedouins from a number of different tribes flock to buy and sell the Arabian camels, goats and cows. The animals are made to go round the circle where the auctioneers bid for their price. 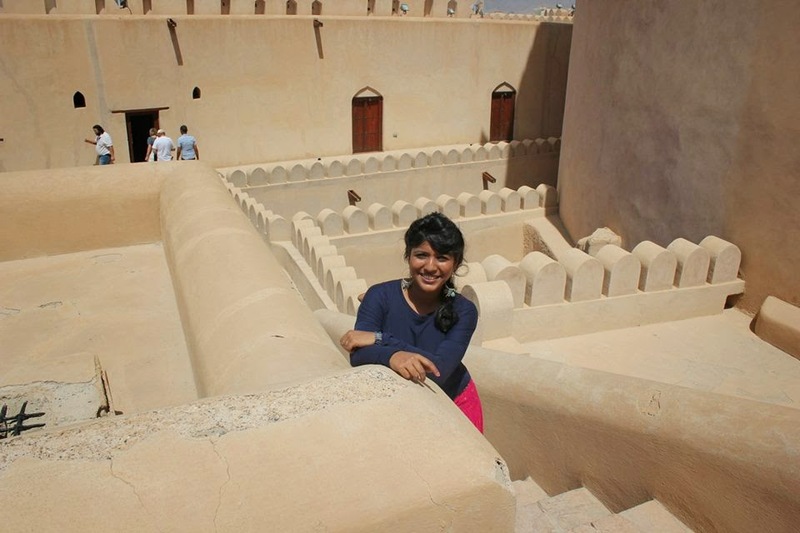 The Defense Mechanisms at Nizwa Fort uses ample amount of Hot Dates on the invading Army.Now that's something! 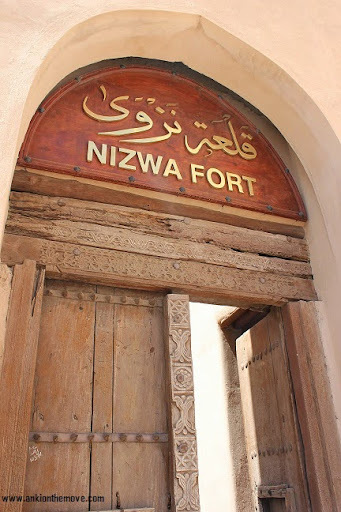 Nizwa Fort comprises of Castle and Fort. The Fort dates back to 1649 and was completed by Imam Sultan Bin Saif Al Ya'rubiI .It was financed by the spoils of war, when the then Imam defeated the Portuguese from Oman in the battle first, then Diu in India and then Zanzibar. The fort was built in 1649 to defend the adjoining castle and that dates back to 851.The scripted paintings on the wall depicts Camels, Horses, Donkeys and Portuguese Ships of different periods. If you look up to your right, you will spot 5 murder holes protecting Nizwa Tower. Murder Holes: In times of conflict, Date Syrup would be heated to boiling and poured down onto the enemy through narrow slits located above the strategic doorways. In order to breach the tower an invading army would be required to break down through sturdy doorways. Its access from the ground is by way of narrow, dark zig zag staircase which has pitfalls to catch the enemies off guard. These deadly pitfalls are now sealed with glass for the protection of visitors. We too climbed the staircase wondering what is behind the glass which pops up occasionally beneath our feet and now we know! Interesting,isn't it? The Fort is 40 m high and is made from Sandstone. When you climb to the top of the massive cylindrical tower, you can see different panoramic views of prison, mosque, mud houses and the surrounding mountains. Oman has 8 million date palms and there is a store inside the Nizwa Fort for storage and processing of dates. The dates are dried in the sun and the baskets are filled with the dates after which after a considerable period of time, the syrups starts coming out through the baskets. The area is kept clean with the underground water, so to have Date Syrup in the purest possible form. 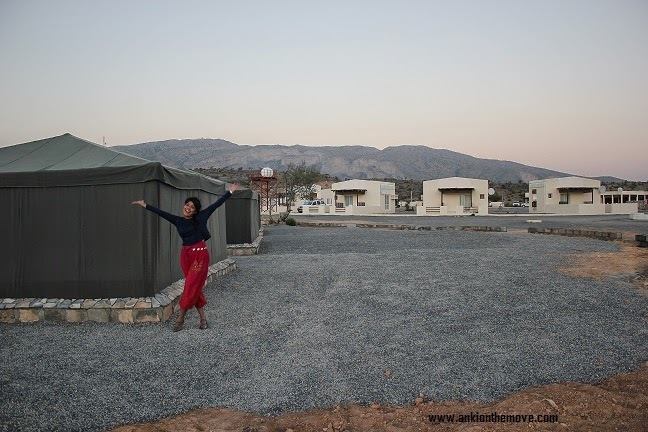 Nizwa is a perfect base for Al Hamra and Bahla. 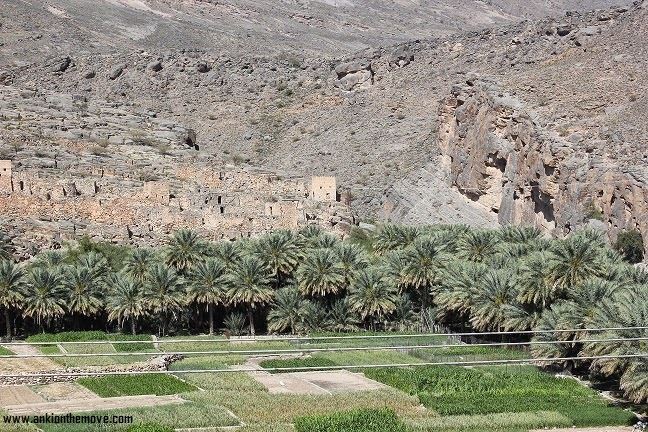 Al Hamra is one of the oldest villages of Oman (400 years old) and has mud houses dating back centuries. The Falaj Daris situated in Oman(near Nizwa) is a world heritage site. Bahla is well known mystical town famous for the exceptional craftsmanship and Bahla Fort. Falaj were first introduced in Oman by Persians in 2500 BC. These intelligent network of canals are part of irrigation system consisting of 10000 channels and diverts water from its source through underground tunnels to open above ground channels which is dispersed to many villages and towns in Oman. 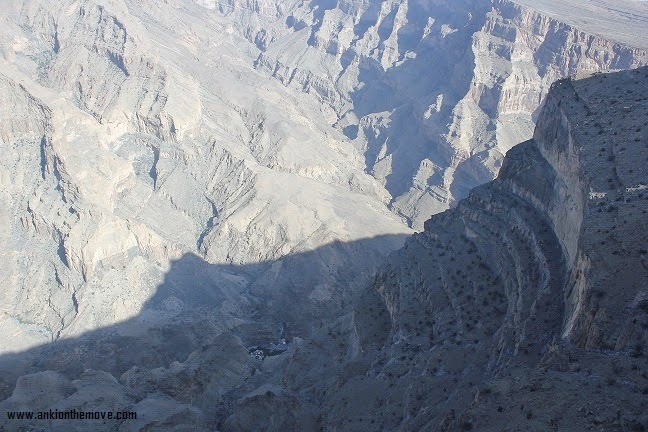 Jebel Shams, world's second largest canyon (after Grand canyon) is 3005 meters and is also known as Grand Canyon of Middle East. Jebel Shams means "Mountains of the Sun" i.e the first place to greet Sunlight at dawn and last to say farewell at dusk. You can find here the world's oldest Juniper trees (more than 100 year old) and you can either mountain bike/trek to the base which approximately takes around 3 hours. We met many villagers on the way selling woven items made into decorative key chains from wool made of goat. Camping if you must, in Oman. This campsite is beautiful with the view of Sunset just dropping down its shadows on the majestic mountains leading to Canyons. Campfires are arranged at night and free WiFi is available at the main reception area. The Village of Ghul is located at the junction of Wadi Ghul and Wadi Nakhar(at the west of Nizwa) leading to Jebel Shams. Ghul is one of the most interesting 1600 year stone village in Oman which is abandoned since 1980's.Proudly standing on left, is the old village of Ghul and on the right is the new village. High up in the same area are extensive defensive similar looking stone structures in almost the same color (a little darker if you look closer) to cheat the enemies to attack the village. The old village & ruins have been built by locally available limestone and therefore blend with the background. The best overview is from the newly built road opposite. 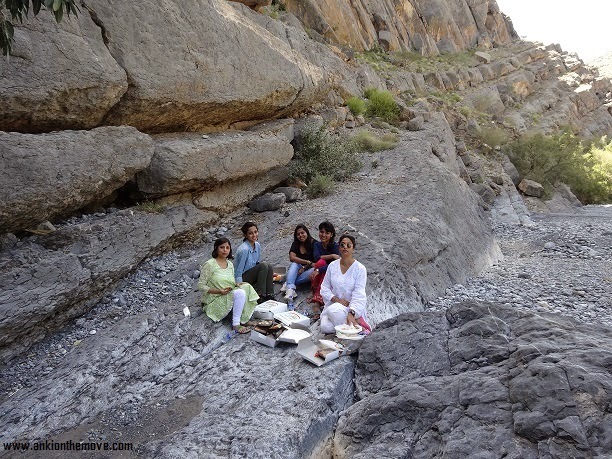 Picnic at Wadi Nakhar - This happens only in Oman - The Outdoors sans the Dirt! We drove down to Wadi Nakhar only to find that the roads ahead were blocked with.The nature of the mountain surrounding is such that you would find limestone and quartz in abundance. The best way to differentiate limestone is from smell. If it doesn't smell, its limestone. If it smells bad, its sulfur. For some of the stones ,if the colors come out white on scratching, it is calcium carbonate else it is Quartz.A green rock could be copper,could be blimey,could be aluminium oxide or could be uranium. The villagers obtain the wool from weaving after shearing sheep and goats and then spinning them into yarn - a process usually done by shepherds, Each ball of yarn, called a kubba, took 4 days to complete and they take out wool and put in water to soften the wool. At the foot of Jebel Shams in Al Hamra district is 2 million years old, Al Hoota Cave. The cave was opened in 2006 and has first electric train in Oman. The cave was formed by dissolution of limestone by acidic water. Total length of the cave is 4.5 km(out of which only 500 m is open to public) and has 2 lakes and over 100 animal species. Along the way to Wadi Bani Khalid are the 500 year old tombs or graveyards. Every year students from Kuwait and Malacca come to study here. The pools of Wadi Bani Khalid are always full of water and is very popular with the locals. We too swam our hearts best at the wadi. Do note that the wadi is deep but is quite a relaxing swim.We saw many locals jumping in the water, and one of them from Omani Army told me about why he can't jump backward due to injury but displayed his front jump jumping from the bridge. We saw many hanging to the bridge and jumping off it! In Arabic,Jabal Akhdar means Green Mountains. Jabal Akhdar is known for grapes, pomegranates, apricots and even crystals in the mountains. 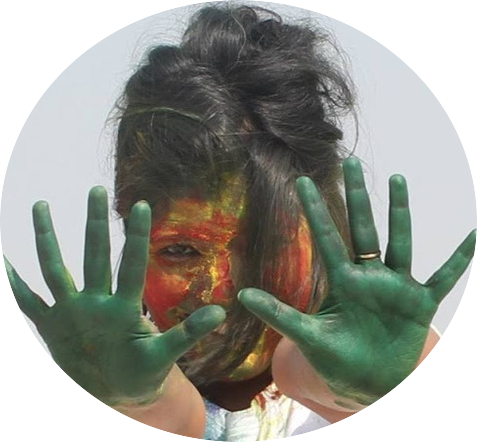 The name Wahiba has come from the name of the tribe Wahiba who have been living in Wahiba Sands for centuries. Wahiba sands is about 1500 sq km and is different geology than any other sand dune in the world. Rest all of the sand dunes are made of limestone but this one is made of corals and sea shells because this whole area was an ocean. You can never get dirty in wahiba sands. In fact,Kaes showed us how even after rolling in wearing a white sparkling dish dasha ,his dish dasha was intact after he stood up. In olden days, there were lot of Bedouins moving from place to place in the wahiba sands(Arabic word Badawi means Desert Dwellers).Now many of them are settled in their new homes, but when you go deep in the sand, you would still find many Bedouins moving from place to place. "All the wildlife is protected by the ministry here" said he with confidence and with that pointed us to a direction where we could see beetles and said in winters the beetles come out, we call them Camel Dunk Beetles. 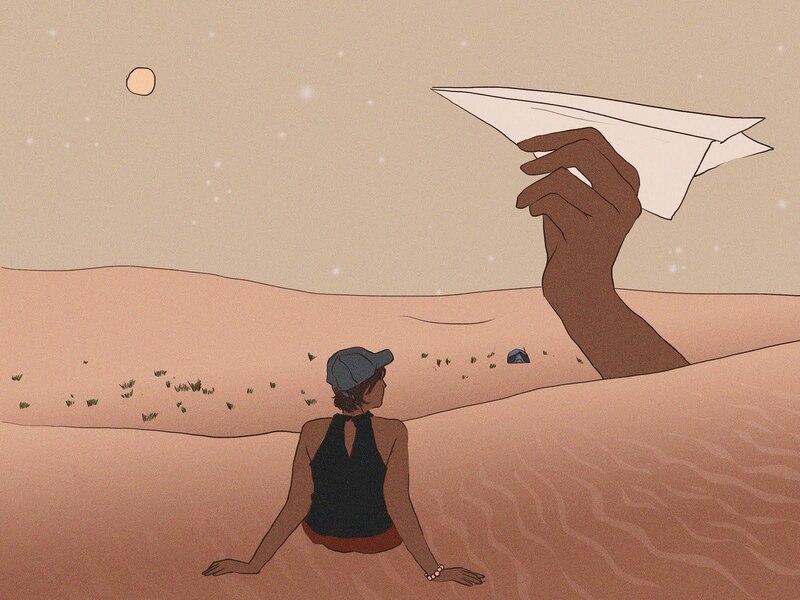 In Summers,you can find spiders and snakes in Wahiba Sands. Bedouins live in Wahiba Sands and usually now have two homes: An old home in the desert and a new home at the entrance of the desert. They earn their living by selling craft work and by providing camel rides. Generally their tents are made of Goat hair and divided into partitions called Gata. They breed the healthy goats and sell them in a market for a price and bring in unhealthy goats and make them healthy again. Their main source of food is milk from Camel and goats and dates found in Desert Oasis.We too were greeted again with a Fwala (Omani Coffee and Dates) and a smiling lady and a man with 3 sons and 4 daughters. Inspired Variation of Woodstock, the Sand Stock 2014 came as a surprise to me. Rock and Roll on the sand and we danced half past the night away listening to music and grooving on the tunes. 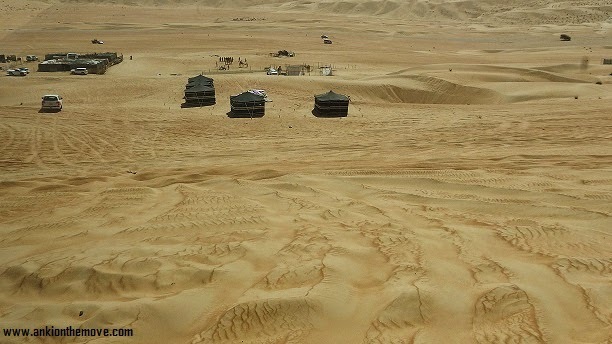 Surrounded by two Sand Dunes on both sides, just in the middle is this beautiful Bedouin style AC camp where we stayed. Our luggage was transported by the buggies and when we went inside, it was the most relaxing sleep. We would get up, and choose the dunes, and try to climb the sand to the top which was tiring (Oh sand pulls), then would call the vehicle take us up there without the pull but would come down like jumping jack hale and hearty! Wow! Superb shots from the place. 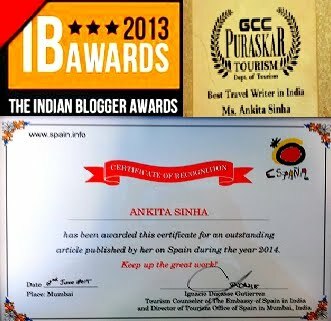 The Great Pictures of the Great Places! 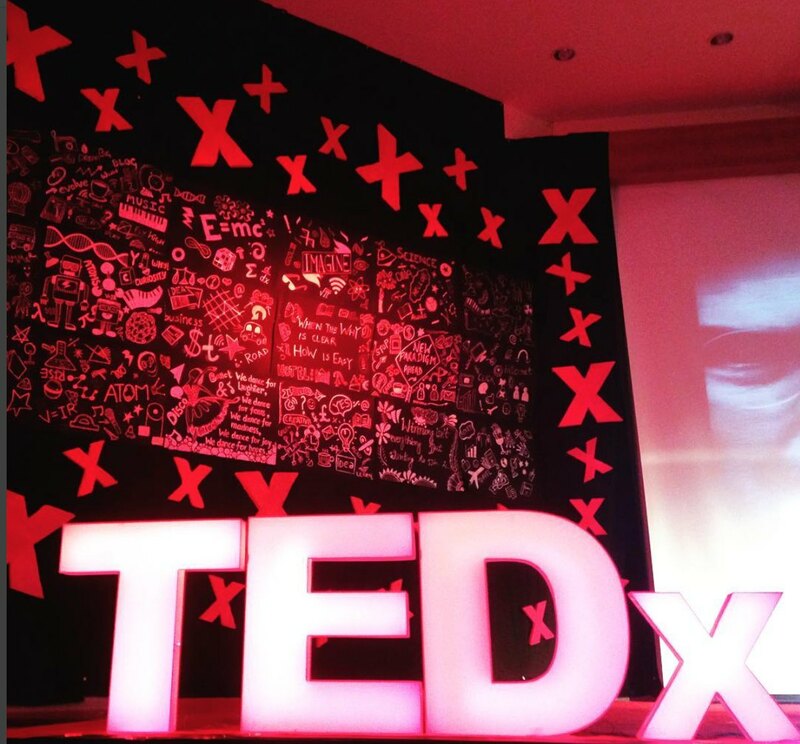 Really worth visting.